Born in Ipswich in 1932, son of a Master Mason. John gained his Master Mason certificate in 1951. He studied at Ipswich School of Art (1951-54) and the Royal College of Art (1954-57) where he was encouraged by Prof. John Skeaping. From 1957 until 1959 John was assistant to Jacob Epstein. His main run of work is the restoration of church monuments. His studio is at Washbrook near Ipswich. His works in Ipswich are the stone wall bearing a symbolic map of the Orwell Estuary with outstanding features depicted in engraved slate. This is just inside the lower foyer of the Civic Centre and a bronze panel on a brick plinth in Upper Orwell Street, symbolising the technical development in foundry methods during the fifty years since the firm of Cranes came to Ipswich. Born in Ipswich in 1952. He studied at Ipswich School of Art and at Bournemouth and Poole College of Art. He then ran a studio of in Dorset for two years before returning to Ipswich where he now takes classes at Suffolk College and teaches sculpture privately from his own studio near Ipswich. 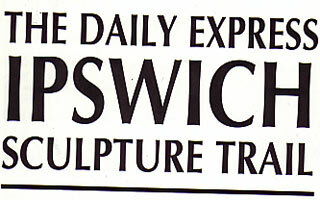 He was approached by the Ipswich Promotion Bureau to design and make the Giles' Family sculpture at the Queen Street, Princes Street junction (opposite the cartoonist's drawing office) which was sponsored by Express Group Newspapers. It was unveiled by September 1993 by comedian Warren Mitchell in the presence of Johnny Speight and Carl Giles himself. Born in 1943. A painter, foundryman and naturalist. While on his National Diploma Course in Painting at Ipswich School of Art, he took a year off (1961-62) to help his neighbour Geoffrey Clarke with his work on Coventry Cathedral. Has been a marine foundryman and consultant engineer since then. His sculpture Sor Of HIng (a newspaper typographical slip-up for "(this) sort of thing") was commissioned by architects Hare and Pert for their St Matthews Street roundabout development and was cast in Geoffrey Clarke's Hartest foundry. He has always lived in West Suffolk. Born in Norwich in 1915. Trained at Norwich School of Art. Reynolds met and exhibited with Henry Moore in 1936-37. Since 1949 has organised nine exhibitions of East Anglian sculpture. Lecturer in Change of Three-Dimensional Design, University College, Suffolk until 1980. The upright features Pylons at the entrance to University College, Suffolk were made in 1961 in co-operation with the architect Birkin Haward. The Ship sculpture now on the Civic Drive roundabout won the Sir Otto Beit medal for Sculpture in 1972. In the Wolsey Gardens behind Christchurch Mansion is Reynolds' Triple Mycomorph commissioned as a memorial to his parents by Tom Gondris. The sculptor's studio has been in Ipswich or nearby Barham for 40 years. Born in Derbyshire in 1924. Towards the end of his studentship at the Royal College of Art he began working on the great nave windows and sculptures for Coventry Cathedral. These were followed by numerous sculptures for cathedrals, universities and office buildings including a vast internal wall relief at Castrol House and a 70ft bronze for Thorn Electric, London. Clarke pioneered the lost polystyrene foam method of casting aluminium in this country. The stained glass window in the University College, Suffolk foyer was the first commissioned work in England to be cast by this method. His studio and huge foundry are at Hartest near Bury St Edmunds. Born in Surrey in 1941. Trained at Camberwell School of Art. Works mainly in clay or bronze. Past President of the Royal Society of British Sculptors. He has public monuments scattered over London and the home counties including the much admired Family Group near Battersea Bridge as well as works in Hong Kong and Tokyo. His two Ipswich sculptures are the bronze Trawlerman in the Sainsbury Hadleigh Road precinct and the Spirit Of Youth commissioned by Churchmanor Estates in St Mary's Court off Museum Street. His studio is at Bexleyheath, Kent. Born in Hertfordshire in 1944. Trained at Watford School of Art. Painter and potter who jointly runs the Barn Studios complex, pottery, tea room and art gallery at Butley near Orford. The bronze of Tam, her daughter, is her first work of sculpture and is sited on the grass triangle between Black Horse Lane and St Mary Elms Church. Born in London in 1949. He studied at North East London Polytechnic (1967-68) and at Winchester School of Art (1968-71). He had a studio in London until 1980 when he moved to Reepham in Norfolk from where he still works. Grandjean has shown widely in Britain and has been included in many important sculpture exhibitions. He had his first major one person exhibition at The Wolsey Art Gallery from which Balance was purchased with the help of Eastern Arts. He has had public works commissioned by Birmingham City Council, Peterborough Development Corporation, Cleveland County Council and the Dept of the Environment. Lee Grandjean is currently Senior Lecturer in Sculpture at the Royal College of Art. Born in Cork City, Ireland in 1927. Studied at Crawford College of Art and Technology (1943-46). He then joined the Royal Air Force and travelled worldwide as an aircraft engineer, continuing this occupation since then with civil airlines. Although he lives in Suffolk he still keeps his connections with Cork and is a member of the National Sculpture Factory. The bronze Ipswich Madonna on the wall closely resembles the oaken statue now in a chapel in Nettuno, Italy, but which was probably once the focal point of the pilgrim chapel of Our Lady of Grace on this site in medieval times. Mellamphy modelled it after studying the statue in Nettuno. The sculpture panel was set up by the Council as a result of the generosity of Express Newspapers plc who after they had contributed to the funding of Giles' Family, donated a sum to promote further sculpture in the town. The panel consists of Borough councillors and officers and members of the public interested in seeing further sculptures in the town. So far it has commissioned Tam and moved The Ship to a more prominent position. Already developers have shown interest in having further sculptural work as part of their plans for new buildings. We hope that this will continue and the Trail will grow longer. And that's all the original text.